The governor expresses hope that Proposition 8 would be overturned as protesters continued to march outside churches across California. 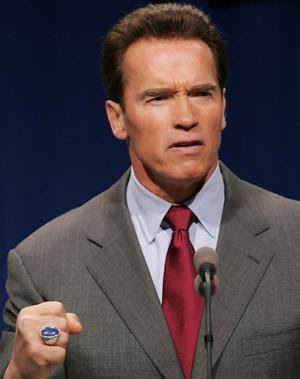 It's unfortunate, obviously, but it's not the end," Schwarzenegger said in an interview Sunday on CNN. "I think that we will again maybe undo that, if the court is willing to do that, and then move forward from there and again lead in that area. He also said that he, along with California Attorney General Jerry Brown, had every confidence that those who were married before the measure passed would remain married. On Sunday, hundreds of protestors lined up outside Mormon and Catholic churches, also at Rick Warren's Saddleback Church. Martijn Hostetler, 30, of West Hollywood held a sign that read "Purpose Driven Hate," a dig at Warren's bestseller "The Purpose Driven Life." But for Sally "Sal" Landers, 52, a Saddleback Church member from Lake Forest, her participation in the protest was a deeply personal matter. Landers and her female partner of three years plan to marry and adopt children. When she received an e-mail from Warren urging a "yes" vote on Proposition 8, she said, "I felt like I was kicked in the stomach by someone who loves unconditionally. Friend of the Court Briefs were also filed by members of the California State Senate and State Assembly, saying that the authors of Proposition (h)8 erred in bypassing the role of the State Legislature. They argue that a measure which fundamentally alters the "equal protection clause" of the California State Constitution is far too radical a step to be accomplished by a simple majority vote. Jerry Brown pointed out that the supporters of Proposition (h)8, by suing to invalidate legal marriages, have already moved farther than they said they would go. He also said that this was typical of their behavior. I learned that you should never ever give up. . . . They should never give up. They should be on it and on it until they get it done."